Every generation wants to believe that it is living in the most progressive era in America’s history. That’s not wholly untrue, but when zeal and self-congratulation overtake the lessons of history, we often find ourselves repeating some of the worst instances in our struggles to make society a more accepting place. Nothing better demonstrates the frightening lack of progression and the dangers that lie ahead than the story of San Francisco politician Harvey Milk. And Milk’s hopeful assent and tragic end are beautifully cataloged in Robert Epstein’s 1984 documentary The Times of Harvey Milk. For those who don’t know, Harvey Milk was a local businessman in San Francisco. After becoming an outspoken member of the gay community, he found himself embroiled in the political landscape when he decided to run for the position of City Supervisor. Though his initial forays into politics didn’t take off, he quickly established himself as a central figure in the Castro District of San Francisco. His unflinching demeanor and candid language were a shock to the system, but they gained him allies from many different walks of life. Eventually, Milk obtained the office of City Supervisor, making him the first openly gay elected official in the history of the state of California and the most pro-LGBT politician in the entirety of the United States. Shortly after his swearing-in, Milk began his crusade to enrich the lives of gay citizens by breaking down barriers that were in place throughout society. However, Milk’s life was ended on November 27, 1978, when former Supervisor Dan White walked into the San Francisco City Hall and shot both Milk and Mayor George Moscone. Both were fatally wounded. White was arrested and charged with first-degree murder, but his defense team successfully argued the offense down to voluntary manslaughter. White served five years in Soledad State Prison and was let out on parole at the beginning of 1984. Less than two years later, White committed suicide. It’s a cavalcade of horror that shook the entirety of the gay community and the political establishment of San Francisco. Epstein’s film captures this all with heartbreaking potency. Interviews with many of Milk’s friends and associates paint a picture of a public servant who truly believed in doing what was best for his constituents and for human rights in general. This piece isn’t going to be a giant breakdown of Epstein’s film or the life of Harvey Milk. Instead, it’s going to be a somber reflection on how viewing The Times of Harvey Milk today feels dishearteningly contemporary. 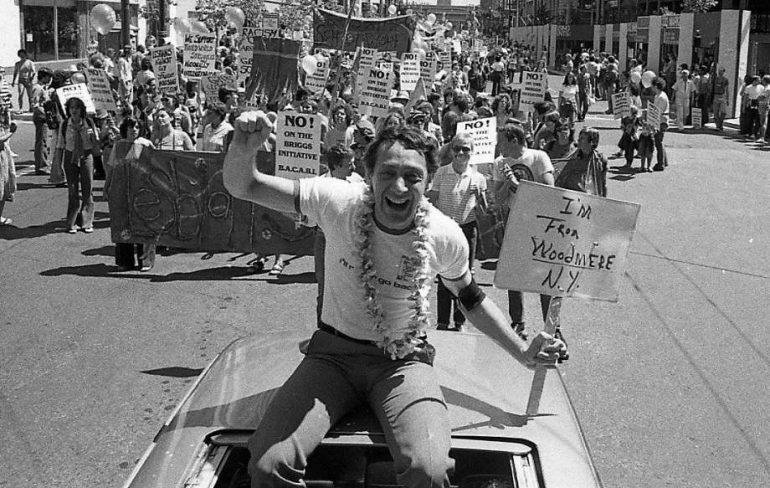 Watching The Times of Harvey Milk should feel like viewing a relic of a bygone and archaic era. But it doesn’t. Instead, watching the film immediately brings to mind the equally sickening acts of violence gay people have been subjected to over the years. It’s difficult not to have images of Matthew Shepard or the Pulse shooting in Orlando crop up in your mind as the aftermath of Milk and Moscone’s murders plays out on the screen. Instead of highlighting just how much progress has been made since Milk’s death, the conclusions of The Times of Harvey Milk act as a sort of air raid siren that alerts you to how little things have changed in the forty years since Milk’s assassination. Granted, that’s not to say nothing has gotten better. Of course it has. It would be wonderful to see Milk alive today and hear his thoughts about a recent episode of Queer Eye or what his opinions of Pete Buttigieg might be. To see gay figures become heralded members of popular culture and political society is a net good in the everlasting fight for equal rights. Harvey’s stance as a gay politician wouldn’t come off as radical today as it did back then. That is wonderful but it’s also something that we take for granted at times. And The Times of Harvey Milk brings that into stark focus. Milk wasn’t some token figure or ornamental politician. His fiery disposition was a necessary weapon in his quest to help normalize LGBT lifestyles. There was never a hint of complacency when it came to Milk’s feelings about his purpose in politics. So much so that there are countless stories documented in The Times of Harvey Milk about his hotheaded nature. Most of these recountings are told through a veil of humor, but it highlights the kind of unfettered passion that Milk knew was going to be an essential tool in his battle with societal norms. And when we look at the spine-chilling enmity that comes from modern movements dedicated to the eradication of equal rights, it starts to feel like that kind of rage isn’t always something to be discounted. Anger can be an effective tool for change if it is properly channeled and Milk knew this. What becomes truly numbing is how Milk’s ardent attitude comes across as seemingly tamped down when reflected against the rhetoric of today. There is a clip in The Times of Harvey Milk that’s taken from a broadcast television debate where Milk is undeniably confrontational, but it never teeters over into a cartoonish display of vitriol and dismissiveness like we see every day from our current administration. There is nothing wrong with being irate when it comes to politics, but there is a hope that the disagreeing parties can at least respect one another as human beings. And throughout The Times of Harvey Milk, we see that Milk was somebody who didn’t just care about gay people. He cared about people. A big takeaway from The Times of Harvey Milk does have to do with the ludicrous result of assassin Dan White’s trial. There is literally not a shred of doubt when it comes to White’s guilt, and yet the justice system is manipulated in order to enact pity on someone who is unequivocally responsible for his criminal actions. The decisions of this trial echo throughout many other stories of America’s criminal justice system. With the current proliferation of true crime series that focus on potentially innocent people being put behind bars, it’s another bit of whiplash that highlights just how little our ability to properly deal with criminal cases has evolved. Not to mention the number of unprovoked murders committed by institutions that we look to for protection, and the disproportionate amount of such perpetrators that get by with little more than a slap on the wrist. Maybe the most striking revelation that comes from watching The Times of Harvey Milk is how little contemporary gay culture seems to bring it up. Admittedly, director Gus Van Sant’s 2008 biopic Milk rejuvenated the pop culture awareness of Harvey Milk’s historic life. But, like a lot of Oscar-winning films, its status in the pantheon of cinema discussion has waned in the decade since its release. And while Milk is certainly a movie worth seeing and talking about, it still falls victim to the unavoidable trappings of biopic filmmaking and coming off as a product of its era. Whereas The Times of Harvey Milk feels (apropos of its title) timeless. There is something raw and universal about the confessional interviews of the movie and the straightforward cataloging of Milk’s life. With so many recent documentary films and series becoming touchstones for discourse about societal woes, it’s disappointing to see that a film like The Times of Harvey Milk doesn’t get referenced when talking about how certain issues have been addressed, ignored, bettered, or worsened over the years. To break the distanced tone of this piece for a moment, I really didn’t know what I was going to feel when I watched The Times of Harvey Milk. With this month’s topic being martyrs, I wanted to look at someone who was a real-life martyr for the cause of LGBT equal rights. Harvey Milk seemed like a prominent figure who happened to have an entire documentary that was dedicated to his story. My expectation was that I’d watch the movie, learn his story, and report it back in this piece with my own feelings about how his story was important for his time. That was where I discovered I was wrong. The Times of Harvey Milk isn’t just some slice-of-life documentary that tries to encapsulate a specific moment in our country’s history. It’s a message to the future. This rug-pull happened to me at the very beginning of the film as we see footage of Dianne Feinstein telling a gaggle of reporters that Milk and Moscone have been assassinated. Then, we hear a pre-recorded message from Milk himself that was to be played in the event of his assassination. There is a literal message to the future in the opening of this movie, and it’s a message that understands how hateful and violent the world is those of us who attain a position of importance while proudly announcing a facet of our lives that makes us seem different. Milk knew there was a good chance he would be murdered in office and he still was committed to being a servant of the public. It made me think of how brave someone has to be to do what he does -- run as a representative of the people when you might not feel like you represent society’s idea of normalcy -- because I will never be that brave. The Times of Harvey Milk is a title that does enforce this idea of a distinct window in time that was opened and closed with the passing of its subject. Instead, it reinforced this idea that the world Harvey Milk fought for is still being fought for and will always need to be fought for. The progressive steps forward we’ve been able to make for LGBTQ+ members of society are phenomenal, but it’s not a process with an endpoint in the near future. No matter what advances we’ve been able to claim, there are new (and old) issues to face. We are still living in the times of Harvey Milk, and it’s awful to know that there will be more martyrs for this cause. What’s important is not only that we remember them, but that we carry on their fight with the knowledge that it’s going to be a lifelong commitment. And we need documentaries like The Times of Harvey Milk to celebrate and commemorate these figures, but it’s even more important that these kinds of art are used to educate future generations. Hopefully, we can one day find ourselves in a world where The Times of Harvey Milk is looked upon as an artifact from a less civilized time. Until that day, remember that the past is closer than you think it is. Drew Dietsch has been professionally writing about film for over a decade. His bylines include Bloody Disgusting, SYFY WIRE, CHUD, Crooked Marquee, and FANDOM (where he was a founding contributor and Entertainment Editor). He created and hosts GenreVision (@genrevisionpod), a weekly film discussion show at genrevision.com.